Thread: 1K$ to spend on family car project. I have been a lurker for a number of years, finally posting. I have a 2.5 year old son and he is loving all things cars. So, I thought it would be fun to start a car project with him. I have tools, skills, and a work space. I am looking for something in the 1K$ range to pick up and start working on. Time line is not super critical, just want to get him learning and I want to have fun as well. 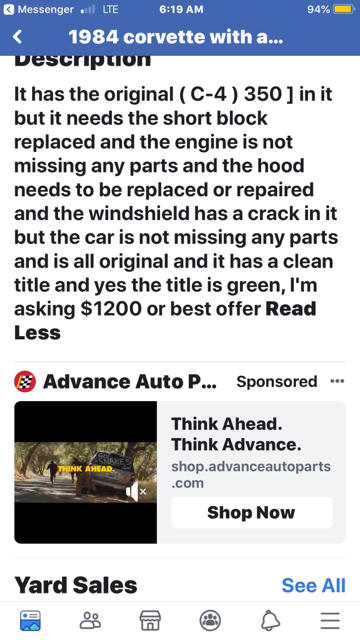 I am open to all makes and models, something looking for a good home. What do we have out there folks? Maybe start with a gocart??? Not kidding. The budget sounds right and it gets a steering wheel in his hands inside of a decade. Goodluck sounds fun either way! Edit. you can make a really fast one and detune it for him or you can buy one for yourself and try to keep up with him. The best drivers in the world started in a go-kart. Last edited by AutoRoc; 04-13-2019 at 02:13 PM. First, welcome themainphrame, to Motown Muscle! great "learning curve" for your son, yet still be fun for you. it will be great, because it'll be time well spent with your son! Do a go cart....I just finished building one with my 4 year old son.